Good Evening...i've just registered this forum so,first of all i want to apologize if in the future i'll ask questions that were already discussed in this forums. Secondly,i would like to ask... Did any one here heard about the Quantum Leap based Novels?! I heard that in one of them a very interesting detail has been reaveled...Sam Beckett has a son. Is that true,and if so- what was his name?! Hello and welcome. I have read about half the novels although I don't believe any of them feature Sam having a Son, I read the backs of all of them here on Al's. He has a son in the fan written VS series here on this website though. I've read all the novels - but too long ago to remember if any feature a son. SBF is correct, the Virtual Seasons stories have Sam fathering a son with Donna, he is called Stephen and is a genius as you would expect with the gene pool from which he was made. 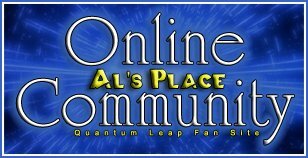 Welcome to the site, (why not introduce yourself in the new members thread, where you will get a proper Al's Place welcome?) and don't worry about asking questions, someone here will have an answer for you. I believe that the only published book that mentioned a possible son was the old "A to Z" book, where on the last page Deborah Pratt mentions possible directions for the series and says something about a son. I can't remember the exact quote, though. Really? Cool,I think Kristen may have that book so I will have to get her to let me see. That sounds interesting. But yeah isz I guess I was right then, the only actual story that features a son is here on Al's in the VS.
O.K so...there is no son in the books. All i can wish for now is that some how i'll be able to find and read the books,but the fact that i'm not from the US won't make it easy. Anyway No son but we still have Sammy-Jo. And in the last part of the "trilogy" in season 5 of QL we found out ,that she was one of the scientists working in her father project. So i have a question to those members here, who read all the books based on "Quantum Leap"... did this detail about Sammy Jo were mentioned in another novel except "mirror's Edge"?! BTW - I'll introduce myself - My name is Itai,I'm almost 28,and i'm a big fan of Quantum Leap since the first time i shaw it on TV in my country - Israel. I think the year was 1993.
a few years ago we got the all series(along "Enterprise) from the start in a new channel that came on the air in Israel called "Channel 10" and i recordrd the all series on 11 video cassettes(And the episode in Enterprise with Dean Stockwell). find and read the books,but the fact that i'm not from the US won't make it easy. I tried amazon,but it seems they're not shipping it to Israel,'cous when i finished my order to all the books i got an error messege that it can't be shipping to the adress i gave. Oh wow, I have not heard of that before. Thats kind of strange. Have you tried the Israel version of Amazon. They have a different version for different countries that way there are no problems sorting out currencies. for example Amazon.co.uk is the UK version and Amazon.de is the german version. I am not sure but there should be one for Israel and it should work better for you. That's the problem - There is no israeli version of amazon. This page details information on shipping to Israel. We are currently able to ship books, CDs, DVDs, VHS videos, music cassettes, and vinyl records to Israeli addresses. There is a good likelihood that your packages will be subject to the customs fees and import duties of IsraelSee both International Shipping Restrictions and Customs Information for more details. Thats a shame. Good luck. If you do find a way to find a way to get Amazon to shop to you, you won't be sorry. a lot of the stories are really good.